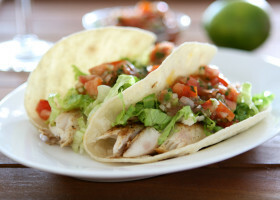 This is a delicious grilled chicken recipe that sings with garlic, lime and cilantro. Grate zest and squeeze the juice from the lime into a glass or ceramic bowl. Add cilantro, garlic, onion powder and olive oil. Add the chicken breast to the bowl and spoon the marinade over the chicken until well coated. Cover the the bowl with plastic wrap and marinate for at least 1 hour or up to overnight. Preheat the grill to medium heat or pre heat an oven broiler. Chicken may also be cooked over charcoal, which we prefer. Place chicken on the grill or under the broiler and discard any remaining marinade. Cook chicken for about 10 minutes on each side or until the internal temperature reaches 165 degrees.